In Scandinavia we're used to food just coming with a salad at restaurants. When my family visited me in England we had dinner together, and they moved their food around a bit, even lifting it, before their finally asked "Where's the salad?" Look at the plate orientation. @Apotato As we say in this country - "meat and two veg". @Apotato You're implying what exactly...? @TheLynx012 I totally agree with that. 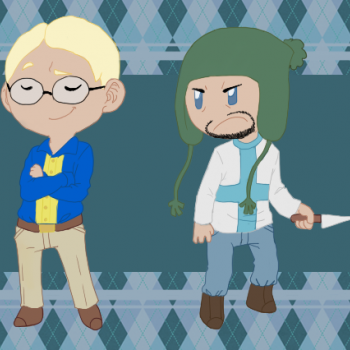 :looks at Denmark's and Norway's eyes: :O "the true derp lords!" My mom and dad would definitely react like that, i would probably just go " Finally! I can enjoy a decent meal with out all the rabbit food! :,D "
gOsH iS ANyOne EVeN HealTHy OUt tHeIR? It's a shame because I love salad. In England you sometimes get a little salad garnish on the side, but most people don't eat it and it goes to waste. I suppose, therefore, that it's better if it is an optional extra so that salad isn't needlessly thrown away. Unfortunately, we're very much a salad-discarding nation, so I'm in a minority as somebody who enjoys, and has always eaten, salad. This is true, my mom asked the same question when we moved to the United States. 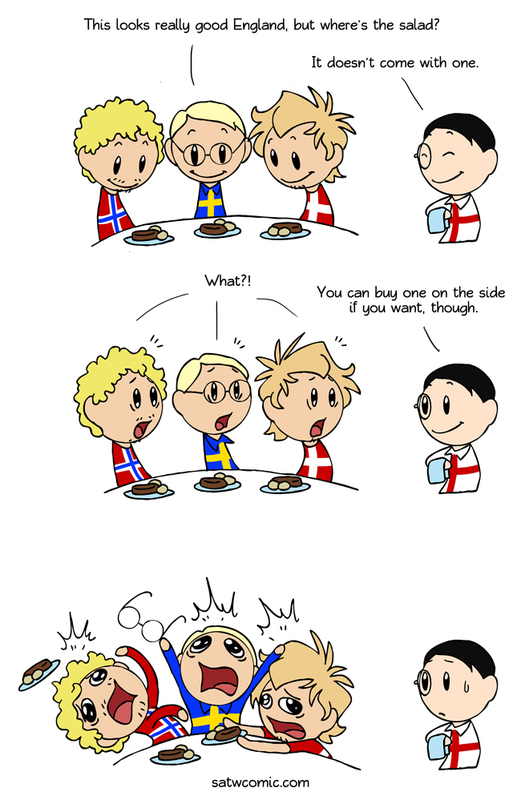 I really like their reaction in the last panel, and especially Norway, just throwing the plate of food. Hey, I can top that for culture shock. Over here, it's quite normal to start a meal at a restaurant with a complimentary selection of spreads and salads (salads as in coleslaw or matbucha or that sort of thing, not the leafy variety) as well as hot bread and some oil with balsamic vinegar or grated tomatoes for dipping. Heck, some places will also offer brined olives and a dish of garlic confit. And like I said, these come complimentary. They're for whetting your appetite while you're waiting for the starters. You could waive them and you wouldn't be paying any less for the meal, or you could eat them and you wouldn't be paying a dime more than you would otherwise have paid if you didn't eat them. So imagine our shock when we got the bill at a restaurant in Rome and found that we were being charged for the bread and cheeses that showed up on our table while we were waiting for the starters to arrive.